The EMS co-sponsored the 99th Annual Meeting of the American Meteorological Society (AMS) which was held in Phoenix in January 2019. The theme of the meeting was “Understanding and building resilience to extreme events by being interdisciplinary, international and inclusive”. It featured over 2,300 oral presentations and 1,100 poster presentations given in 460 sessions. In addition, there were nearly 100 exhibitors. About 3,700 people participated in the meeting, but this was about 500 less than expected because of the impact of the US budget shutdown on a large number of government workers. 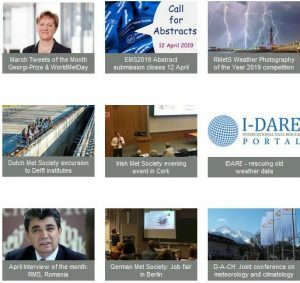 Engage with the whole meteorological community: professional, academic and amateurs. Support students & early career scientists. Help children and the general public become more aware of the importance of weather and climate. A highlight of the meeting was seeing Tim Palmer being made an Honorary Member of the AMS. Tim is a past-President of the Royal Meteorological Society and he received the EMS Silver Medal in 2012. The award is given to someone of acknowledged pre-eminence in atmospheric or related oceanic or hydrological sciences. The AMS Council selects just two or three individuals each year for this recognition. 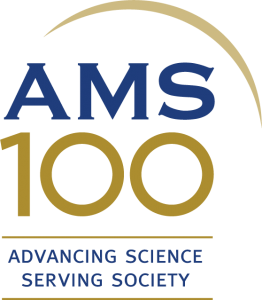 The AMS was founded in 1919 and the next Annual Meeting in Boston will be part of its centennial celebration. The Centennial Campaign aims to raise about $9 million in donations from members and corporations which will be used to fund new initiatives such as those concerned with student travel grants, science education programmes, cross-discipline collaboration efforts, and scholarships.